What is a product manager without a product? Nothing. That’s why it’s so very important that when a product is being developed that the product manager be involved. Now exactly how best to go about doing that is an entirely different question. HOW DO YOU KNOW IF YOUR PRODUCT IS ON TRACK OR IN THE WEEDS? The process from having an idea for a product to actually having a product is a long and treacherous road. So many things can go wrong that either cause the schedule to have to be extended or cause a product with the wrong features to be developed. A product manager needs to discover ways to stay involved in the process while at the same time not slowing things down. That being said, a product manager is not a project manager. There can be a number of similarities between the jobs, but a product manager is responsible for so much more than a project manager. The difference between the roles has to be understood and communicated to everyone who is involved in the creation of the product. The good news about product development is that it is something that has been done many times at other firms. By taking the time to study their successes and failures product managers can learn what they need to be looking for in order to detect development issues before they derail a development project. Creating a way to map how a customer performs their job can provide the input that is needed for a development program. It can be all too easy to include or exclude features from a product that the customer will feel strongly about. Taking the time to understand how your customer will use the product that you are developing is the key to creating a successful product. This book has been created to pull all of these ideas together into one place for product managers. 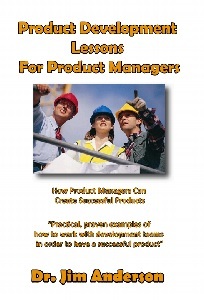 By reading the book you will be able to discover just exactly what the role of a product manager should be during the product development process. By doing this, you can ensure that when it’s all done, you’ll have a product that your customer will want to buy.